The Pip Kickstarter campaign is a little over a week old and it is now within touching distance of being a success. With 20 days to go and having achieved funding of over £27,000, the goal of £30,000 should be reached within a day or two, I expect. 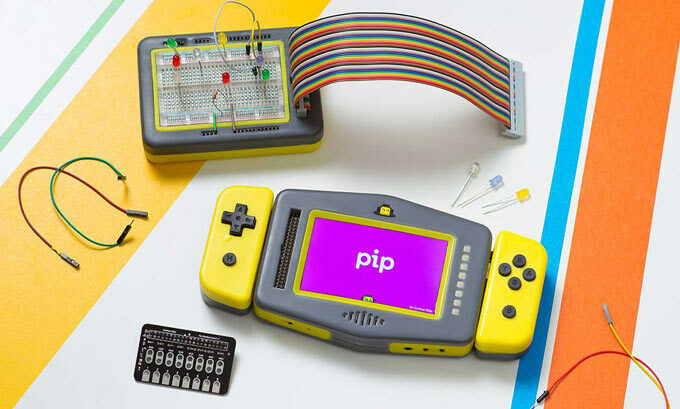 Pip is an interesting device for those that like pocket consoles and the ability to digitally create and tinker. The Kickstarter project and device were created by an outfit called 'Curious Chip', with the aim of putting a Pi in your pocket for digital creation and gaming shenanigans. "Make fun games, invent your own apps, or take control of objects around you! Start with drag and drop programming, then go on to play with real code, tinker with technology and invent with endless possibilities," reads the product summary on the Kickstarter page. Even those without their fingers on the pulse of technology will recognise that the Pip takes at least some inspiration from the Nintendo Switch. Its form factor borrows from Nintendo's design with a central touch screen (800 x 480, 4-inch, in this case) flanked by left and right detachable controllers. However the Pip is very open to tinkering - in both software and hardware. At the heart of the Pip is a Raspberry Pi Compute Module 3. If you buy this 'console' it will come with a selection of apps and games and is ready to use, with more downloadable from an online arcade. The developers have sought to make the Pip fun and easy to program with the simple 'Curiosity' programming environment. Pip includes template projects so you can make your own games and apps. To use this you access the Curiosity programming environment via your regular PC's browser. You can test the apps/games you make in the browser via emulation and then send over the results via Wi-Fi to Pip when you are happy. If you aren't into the educational aspect and dabbling in Curiosity programming, you can even swap out the included SD card and run a traditional Raspbian Linux distro and use Pip like a regular Pi. Hardware tinkering is encouraged and the Pip includes such things as easily accessible GPIO pins to connect jumper leads, lights, controllers, servomotors, and more. There are a variety of HAT add-on boards available on the market which can extend Pip functionality and last but not least there is an optional Maker Pack from 'Curious Chip' which provides things such as an integrated camera and a Pip Breadboard Kit. Other standard connectors available to Pip users are a couple of USB ports and an HDMI out. The entry level funding pledge to get a fully equipped Pip system is currently £150 - for the Pip Early Bird. The finished estimated RRP for a Pip system will be £199. 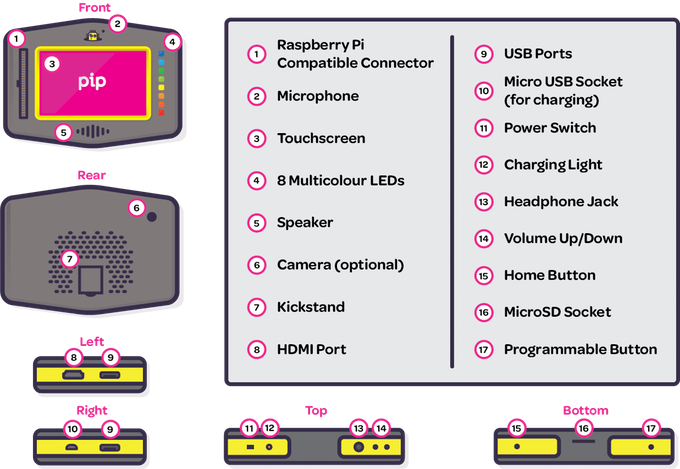 There are also more expensive Pip bundles which include various maker hardware items and multi-pack Pip deals. I was half expecting this to look like a Pip-Boy from the Fallout series,so disappointed myself. Vtech called, can they have their 80s toy back ? It reminded me of Pip from South Park!